If you own a delay with a tap tempo input or a the Boss RC Loop Station an external tap tempo control is a handy unit to control your device. 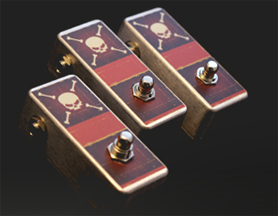 Skull Taps offer a low profile tap tempo controller with a little attitude. We offer various styles of tap tempos to meet your needs – from polarity switching, double taps, dual jacks, etc. Please view the store to find a Skull Tap that best fit your requirements. Not sure which Skull Tap is right for you, please check out the FAQ.